How nice of the golden arches to release a new BOGO coupon for Smoothies, Strawberry Lemonade or Frappes during this blast of summer heat. You can print and use this McDonald’s coupon through July 31st. You can also check out other printable fast food coupons here. Right now you can print a coupon at Bath and Body Works for $10 off a minimum $30 purchase. If you’re shopping online, you can use code SHOP 30. The coupon is good through June 5th. Since B&B currently has the Buy 3 Get 3 Free on their Signature Collection body care, this might be a good time to stock up or buy graduation or shower gifts. 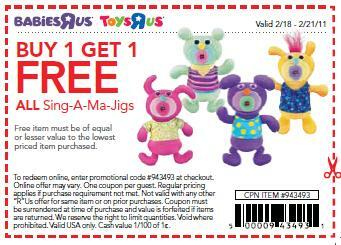 Sing-a-ma-Jigs BOGO with coupon. Click HERE. 40% ALL FurReal Friends Furry Frenzies Sale 4.80 – 13.79 ea. 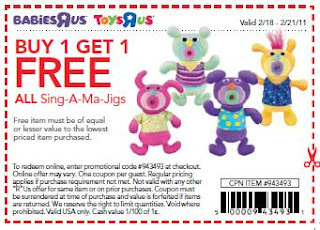 See the entire ad for Toys R Us HERE.